the best alliance between French fashionable designs and traditional German craftsmanship. “Urban Fashion” shapes and unusual natural horn colors are the characteristics of this collection dedicated to young and sophisticated men and women looking for something unique to them. Each frame is a little bit different, as nature ensures that each horn is unique too. CERF BOIS colors are all very unusual and rare and have been selected with utmost care so as not to resemble any other horn frame. Up to 9 layers of natural horn are used for each frame, in a special manufacturing process that ensures strength and reliability. 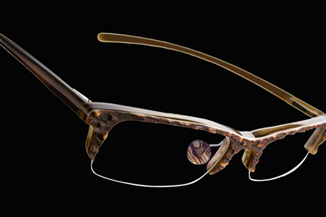 Natural horn eyeglasses are not only light and comfortable to wear, they are also suitable for allergy sufferers. CERF BOIS eyewear is 100% environment friendly. No toxic chemical substances are used in the manufacturing process, and surplus production materials (horn dust, chips) are recycled into natural fertilizer.